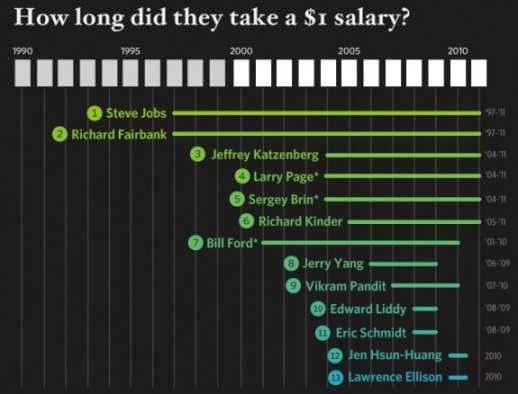 Page, Zuckerberg, Murthy And Jobs – The Truth Behind The Altruistic 1 Dollar Salary? In a world with a human population of more than seven billion people there are only 1226 U.S dollar billionaires. This implies that only two in every 10 million individuals on planet Earth have a Billion Dollars to spend. Logical thinking will suggest that to make this group even more exclusive the one billion dollar entry barrier needs to be raised. Ironically though, to make this group super-exclusive one needs to join the 1 Dollar Salary club. There are less than 50 individuals who are part of the 1 Dollar Salary club whose entry criteria requires the person to slog away for the growth of their organizations at an annual compensation of $1. What is the real truth behind this staggeringly low remuneration, find out as we explore the trend in detail. In 1978, Lee Iacocca as the President and CEO of a struggling Chrysler Corporation pioneered the concept of the 1 Dollar Salary. Prior to lobbying the government for a bailout, Lee modified his compensation to accept only one dollar in salary per year. He also adjusted the monetary incentives of his executive team linking them strongly with the performance of the company. Following his decision and his ability to get the support he needed to keep Chrysler running, many other CEOs in that period followed suit and since then the concept has been around. Although the notion has existed for more than 35 years its adoption has been rare and limited to only a select group of individuals. As of today, there are only a handful active CEOs and Executive Chairmen who on paper accept a 1 Dollar Salary. The most prominent one’s include Steve Jobs (former CEO of Apple INC), Larry Page and Eric Schmidt (Google), Mark Zuckerberg (Facebook), Meg Whitman (Hewlett Packard), Richard Fairbank (Capital One), Larry Ellison (Oracle), Richard Kinder (Kinder Morgan), Kosta Kartsotis (Fossil), Mark Pincus (Zynga) and most recently N.R Naryana Murthy. So why do these extremely powerful, influential and smart executives agree to offer their services and quite literally slog it out for free? The truth is that they don’t and then there is much more than meets the eye if you take everything on face-value. To understand this better it is important to first appreciate the reason why chief executive officers choose to opt for a 1 dollar salary. In most cases such a decision is based on one of two factors; a) the organization is on the verge of bankruptcy or has been showcasing no growth for extended periods of time b) the firm is confident of experiencing extra-ordinary growth in future as a result of initiatives that are not in the public domain. In the case of the former scenario whose examples include Lee Iacocca, Steve Jobs (on his return to Apple in 1996), Meg Whitman (since her appointment as CEO in 2011), Mark Pincus and Naryana Murthy (current) the company is seeking a turn-around and its leader is keen to start things of on a positive and inspirational note. As Mina Kimes from CNN notes in her piece titled “A $1 CEO isn’t a bargain“, A CEO who accepts an annual salary of $1 sends a powerful message — namely that he or she is a team player who wants to make a sacrifice for the good of the company. True, the executive is probably receiving generous stock options on the side, but those payments depend on the corporation’s success. The buck-a-year salary is a grand gesture, intended to broadcast the CEO’s confidence in the future of the business. This holds true for the second scenario (option b) as well as showcased by the 1 dollar salary of Larry Page, Mark Zuckerberg and Larry Ellison who are all leading companies in excellent financial health with significant growth prospects in the future. Apart from openly signalling the confidence of the CEO in the future of the organization, the 1 dollar salary for the leader also creates positive PR and brand perception in the mind of the consumer. This is particularly true in today’s era when CEO compensation is a topic of much heated debate. We find evidence consistent with the view that $1 CEO salaries are a ruse hiding the rent-seeking pursuits of CEOs adopting these pay schemes. Rather than being the sacrificial acts they are projected to be, our findings suggest that adoptions of $1 CEO salaries are opportunistic behavior of the wealthier, more overconfident, influential CEOs. Research from Fisher COB classifies executives like Whitman, Fairbank and Ellison under the ‘Managerial Power Hypothesis‘, one of the three proposed frameworks which explain why CEOs agree to take a 1 dollar salary. Not all CEOs are all talk and no show though, there is an even smaller club of 1 dollar salary executives who are the real deal. Kosta Kartsotis is an 11-percent shareholder and CEO at the watchmaker Fossil (NASDAQ:FOSL). He has held his position with a $1 salary since at least 2008, and the company issues no dividends. All of the value he gets is from his shares. Kinder Morgan (NYSE:KMP) CEO Richard Kinder, also earns a dollar from the company each year. On top of that, he takes taxis instead of limousines, doesn’t fly first class and didn’t allow the company to purchase a corporate jet. Fisher COB’s study classifies such CEOs into two other categories which are part of the ‘Alignment‘ and ‘Signaling‘ hypothesis. 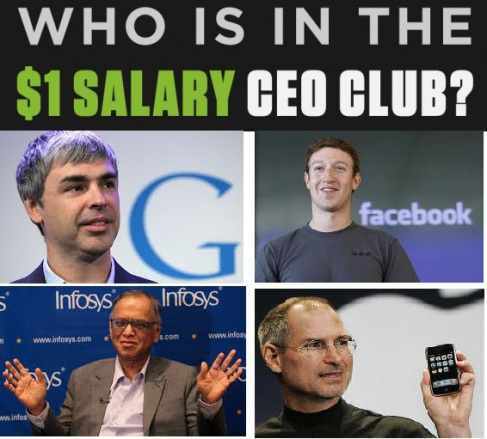 Google’s Larry Page and Facebook’s Mark Zuckerberg are also believed to belong the real club of 1 dollar salary CEOs however the specifics of their financial benefits is not clearly known. The study on this issue by Loureiro, Makhija, and Zhang as described above appears to be quite exhaustive and conclusive indicating that the 1 dollar salary is merely an eye-wash. However, the results of most research efforts like these largely depends on the methodology used by the researchers. There are also alternate findings which indicate that executives who received higher total paydays were likely to underperform going forward, while those who receive lower pay packages were likely to achieve improved stock returns and performance. Irrespective of which view maybe correct, the one thing that can be said with certainty is that accepting the 1 dollar salary does make the CEOs compensation highly variable. This is a risk that only super-capable CEOs are willing to take. In many instances these CEOs are co-founders of the organization who own a significant chunk of the equity and also have the desire to shape the destiny of the organization based on their vision of the future. Are you an entrepreneur who takes little or no salary while slogging it out for the success of your venture? What are your thoughts on the concept of the $1 salary? Share them on this thread by dropping a comment? Taking a $1 dollar salary is not about “slogging it out for the success” of the firm – it’s about these CEOs finding more tax-efficient ways to pay themselves!